Whitening toothpastes are often marketed as an inexpensive way to brighten your smile without resorting to harsh chemical bleaching treatments. There are plenty of different whitening toothpastes available that claim to be able to remove stains from your teeth to gently whiten them. This sounds perfect, but how effective are whitening toothpastes? Whitening toothpastes are designed to remove stains from your teeth without bleaching them. They use tiny abrasive particles to restore your teeth to their original whiteness (before they became stained), rather than artificially whitening them. When combined with brushing, these abrasive particles remove debris from the surface of your teeth. 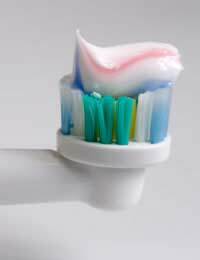 These has been some concern that the abrasive particles can damage your teeth and gums, but experts believe that this is not the case. Most types of whitening toothpaste contain silica, although some do contain low levels of hydrogen peroxide (which is also found in teeth bleaching products). Whitening toothpastes tend not to have a significant effect on the overall colour of your teeth. To achieve a dramatic change in appearance, you need to have your teeth bleached. This will usually alter your teeth by one to two shades, which will remove all but the most stubborn stains. In the UK, most whitening toothpastes do not contain enough chemicals to be able to bleach your teeth. The EU has strict policies on the ingredients of whitening toothpastes. In other parts of the world, you can buy whitening toothpastes with higher levels of hydrogen peroxide. While these are more effective in terms of whitening your teeth, they are also more likely to irritate your gums. The British Dental Association suggests that only certain whitening toothpastes are actually effective in removing stains. The Macleans Whitening toothpaste is the only whitening toothpaste to be accredited by the British Dental Association. They do not accredit toothpastes on their whitening abilities alone though – toothpastes are accredited on the basis of their dental health qualities. Which Whitening Toothpastes Work Best? If you are happy to pay a little extra for effective stain removal, the Beverly Hills Formula Natural White toothpaste is recommended. If you are more interested in whitening your teeth (rather than simply remove stains), Janina Whitening Toothpaste contains a small amount of peroxide to gently bleach your teeth as well. This is more expensive than most whitening toothpastes, but it is considered to be one of the best. If you have sensitive teeth, it is best to look for a whitening toothpaste that is specifically suited to sensitive teeth. Most of the supermarkets have their own brand varieties of whitening toothpastes for sensitive teeth, or you can try Sensodyne Gentle Whitening Toothpaste. Whitening toothpastes are designed to remove stains from your teeth to display their natural whiteness. They contain small abrasive particles that rub debris from the surface of your teeth, especially when combined with brushing. Some whitening toothpastes contain hydrogen peroxide (which is also found in bleaching products), but EU policies restrict this to a low level that will not have a dramatic effect on the overall appearance of your teeth. Whitening toothpastes sold in the UK may be able to remove some of the less stubborn stains from your teeth if used regularly, but more significant stains would probably need to be professionally whitened using bleaching or laser whitening.